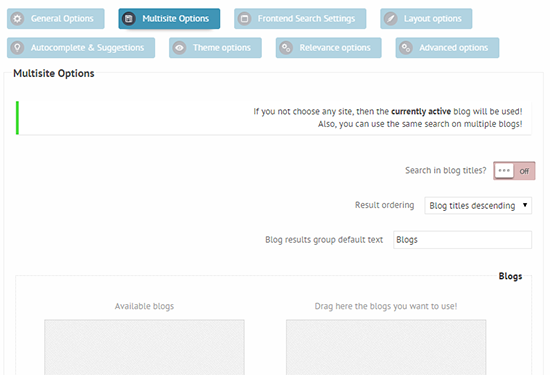 On this option panel you can select the blogs you want to use, and if you want blogs titles as results in the results list. If no blogs are selected, then the currently active blog will be used. Under the Blogs option, there is a drag-and-drop module, which allows choosing the multisite blogs, you want to search across. By default, the currently active blog will be used. The plugin by default return posts and pages, so don't forget to choose the desired custom post types under the General Options -> Sources panel. On the same panel, enabling the 'Search in blog titles?' option, will allow the plugin to return blogs as results. There are a few limitations with the search engine when using a multisite installation. Categories and terms with equivalent names across the multisite network have different ID's. Therefore it's not possible to properly display and exclude them. Custom Post Types across the network must exist in order to be returned. For example: Displaying WooCommerce products from Blog 1 on Blog 2, Blog 2 must also have WooCommerce installed (network installed). Some custom fields might exist on one site, but not on the other. Use custom field filters only if the affected custom field exists on each site.